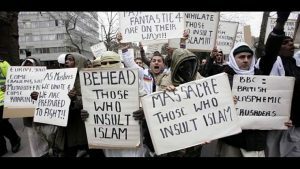 From Associated Press (via Sacramento Bee): An Afghan asylum-seeker accused of stabbing two Americans in Amsterdam believes that Islam is insulted in the Netherlands, Dutch prosecutors said Monday, giving the first indication of why they think a “terrorist motive” was behind the attack. The 19-year-old suspect is accused of stabbing the 38-year-old tourists Friday in an unprovoked attack after he arrived at Amsterdam’s Central Station on an international train. The American men were not targeted because of their nationality, which the alleged attacker did not know, prosecutors said. The suspect’s grievance was with the European country where the assault took place, they said in a written statement. “It is apparent from his statements that he believes that in the Netherlands, the Prophet Muhammad, the Quran, Islam and Allah are repeatedly insulted,” prosecutors said, noting that the young Afghan man specifically mentioned Dutch lawmaker Geert Wilders, who is well known for his fierce anti-Islam rhetoric. “From the suspect’s statements so far, it is clear the man had a terrorist motive … and that he traveled to the Netherlands for that reason,” the prosecutors’ said. Earlier Monday, German authorities said the man had applied for asylum in Germany and was not considered a security threat there. Wilders last week called off a planned contest for cartoons of the Prophet Muhammad following death threats and concerns other people could be put at risk. Prosecutors said the suspect did not mention the contest in his statements. The prosecutors added that there was so far no indication the suspect, identified as Jawed S. under Dutch privacy rules, was working with anyone else. They suffered serious, but not life-threatening injuries in the attack. The judge extended the suspect’s custody because of fears he may flee, repeat the crime or violate the law, according to a statement by an Amsterdam court. This entry was posted in crime, Culture War, Europe's refugee crisis, Evil, Islam, Liberals/Democrats/Left, Middle East, Muslim refugees, Taxes, Terrorism and tagged Afghanistan, Amsterdam, Draw Prophet Muhammad, Geert Wilders, Netherlands, Religion of Peace. Bookmark the permalink. The State Department should issue a travel warning, advising Americans against going to the Netherlands — and all of Europe. Islam needs to be eradicated in its entirety. If not, you can kiss the civilized world good-bye. So glad I went to Europe over 20 years ago, while I could still enjoy it. I knew I wouldn’t be able to go back until once any kids I had were grown, and now that’s the case, I wouldn’t go back. Not unless it was in Eastern Europe, which I missed the last time, and which is the only area that understands the mooslime threat. I was there in the late sixties and early seventies. It was fine. Very peaceful, no violence. Very civilized. Now look at it. These Odorists certainly don’t work for us. Feed him to pigs. They’ll eat anything. Heard they ate a farmer that fell into the pen somewhere out in the liberal northwest.